Free Shipping Included! Victorian Organics Little Girl Toddler Pantaloon Organic Cotton Lace Long Pant (3T 3 Toddler, Off-White) by Victorian Organics at Resha Laser. MPN: 3T-ToddlerPantaloon-WhiteKnit-VO. Hurry! Limited time offer. Offer valid only while supplies last. Toddler Pantaloons by Victorian Organics are soft, easy, comfy, vintage-style bottoms, inspired by the pants worn under dresses in the Victorian era. 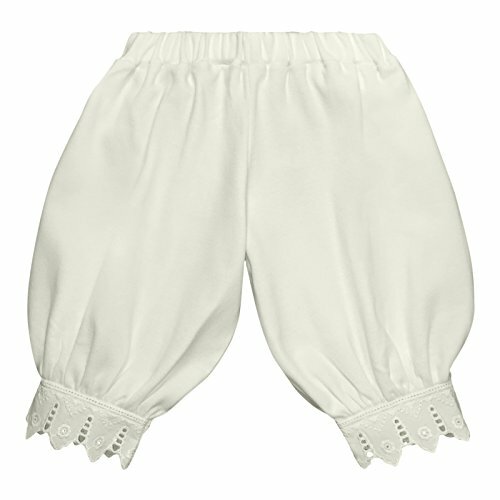 Toddler Pantaloons by Victorian Organics are soft, easy, comfy, vintage-style bottoms, inspired by the pants worn under dresses in the Victorian era. The lace trimmed pants are the perfect present for a little girl, an antique-style gift sure to be a future heirloom. Comfortable covered elasic at the waist makes it easy to pull off and on all by herself. The classic long pants are cut loose with legs gathered into ankle cuffs. Ariadne designs new children's clothes made of organic cotton knit with 100% cotton eyelet lace trim that will make everyday special, and special occasions a natural occurrence. This old-fashion, retro garment is just the fashion for holidays, birthdays, weddings, costumes, fairy tale looks, family portraits, and charming keepsake photos of your child. Wash on gentle in a lingerie bag to keep the garment looking like new. Hang to dry on a hanger, or lay flat on a towel, and finger press the wet lace to smooth the wrinkles out, or press damp lace with a warm iron. If using a machine clothes dryer it is recommended to dry the garment with low heat and press the lace with a warm iron. Minimal shrinkage. If you have any questions about this product by Victorian Organics, contact us by completing and submitting the form below. If you are looking for a specif part number, please include it with your message.